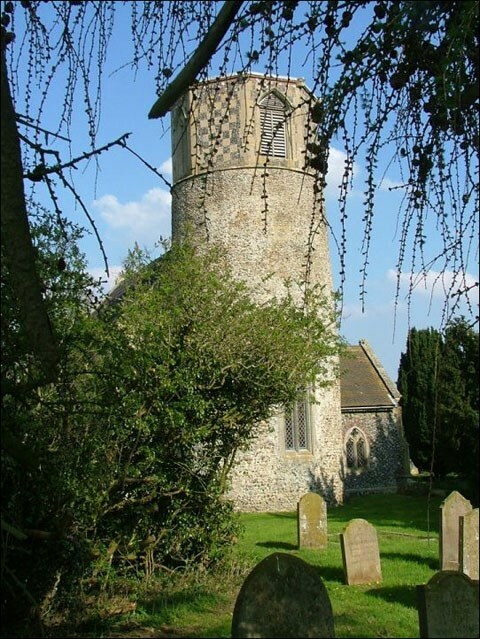 Situated in the small Breckland hamlet of Breckles, St. Margaret is a classic Norfolk round tower church. Its history is closely linked to that of the nearby, fine Elizabethan mansion, Breccles Hall, with intriguing stories and legends concerning Catholic recusants. Inside you will find an excellent example of a square Norman font with carved figures and, in the chancel, an unusual burial. The church was originally a dependent church of West Acre Priory and is now part of the Wayland group of parishes. Breccles Hall which can be seen nearby is a Grade 1 listed building, built in 1546, most probably on the site of an original Saxon Great Hall. Note that, while the village name is now spelled Breckles, that of the hall is spelled Breccles; the spelling used for the manor in mediaeval times. Through the ages the owners and other occupants of the mediaeval hall have played a considerable part in the affairs of the parish. With so many owners, only passing reference can be made to them, but one family in particular stands out in relation to the church and hall; that is the Woodhouse Family. Francis Woodhouse and his wife Eleanor were devout Roman Catholics, and as such were tolerated in the in the reign of Queen Elizabeth I, being allowed to retain priests to hold mass in their private chapel. However, by the 1590s any such priests were liable to the death penalty; hence the priest hole at the hall, still in existence today, as is the secret spy hole. Everybody at this time had, by law, to attend the Church of England services; failure by the recusants, as they were called, to attend these services could, and did, lead to fines of £20 per month. As for the Woodhouses, their faith never deserted them. Following fines and imprisonment for recusancy, they were, in 1599, forced to sell the hall. It is worth noting that they then moved to Caston where they proceeded to harbour a further three Roman Catholic priests. Since that time a persistent local rumour has existed, so far unsubstantiated, that an underground passage runs between the hall and the church. For full information on how you can expand the Church Micro series by sadexploration please read the Place your own Church Micro page before you contact him at churchmicro@gmail.com. Va gur qnex. Ybbx sbe n tyvag!